We’ll remember 2017 as the summer that food trucks rolled out onto the streets of Morgantown. Who’s behind the wheel? The roving restaurateur lifestyle appeals to a certain kind of person, it turns out: part gypsy, part mechanic, all chef. They’re risk-takers, too—these vantrepreneurs invest anywhere from $50,000 to $100,000. But mobility lets them serve what they want, where they want, when they want. 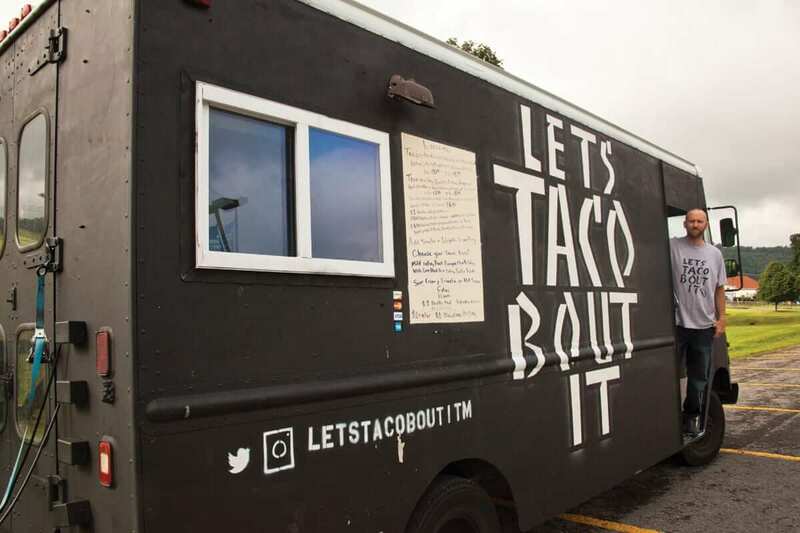 Follow the line at any farmers’ market, mall, wedding, or festival, and you just may find yourself under a truck-side awning enjoying some of the city’s most exciting cuisine. Meet a few of our food fad nomads. If you ever want to open a franchise restaurant, run the numbers. That’s what David Pyles and his family did. 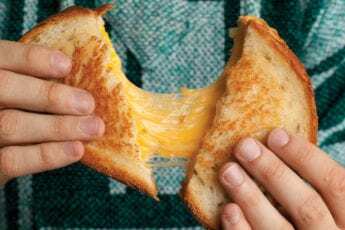 He was thinking of opening a Noodles & Company fast casual franchise in Morgantown but found that a food truck made more sense for him financially. “Plus, you can close during winter and spend time with your family,” he says. “Opening a restaurant, you can’t do that.” So the idea for a noodle store like many across the U.S. became the very unusual idea for a noodle truck. “There are a lot of Vietnamese trucks that have noodles, but not gourmet pasta—I think like four or five in the nation, that I was able to find. I wanted to give Morgantown something different and see if they would respond, and it’s ended up working out.” He first rolled out in April 2017. 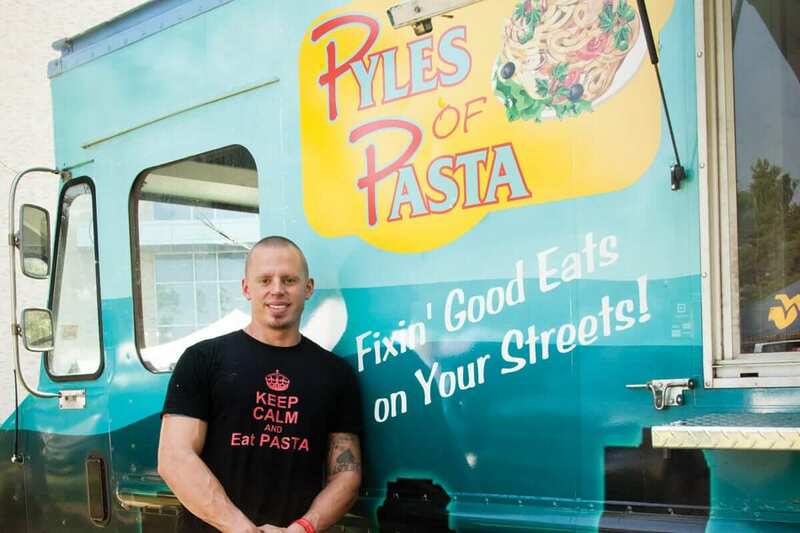 The Pyles of Pasta crew works the corporate lunch crowds: the medical offices at University Town Centre on Mondays, the WVU Medicine Farmers Market on Wednesdays, Teletech at the Mountaineer Mall on Fridays. You’ll find them other places on other days—follow them on social media to track them down. Best Barbeque Ever built up a huge base of loyal diners in the short time it was open in Sabraton in 2015. So when Charlie Heard closed the restaurant based on rumors a road would be coming through the building he was leasing, hungry fans pestered him. “Our main plan was to open up a packing and distribution center,” says Heard. He used to distribute through Kroger and has a ready market for his product. 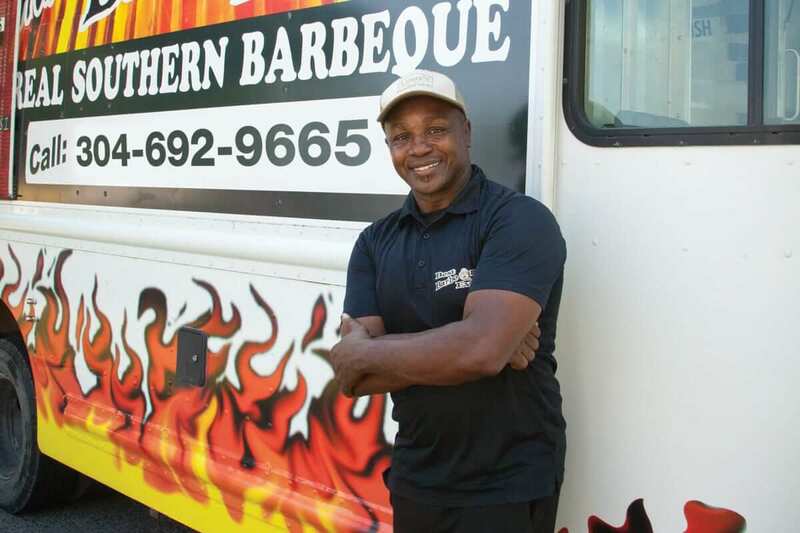 “But so many people kept asking me, ‘When can you open back up?’ ‘Where can we get your barbecue?’ I saw a food truck for sale so I went ahead and did that.” He first served up his brand of delicious out of the truck he calls Heard’s Best Barbeque Ever in October 2016. Heard had a high school wrestling record of 101–2 in his native Georgia. After a strong showing in NCAA wrestling at the University of Tennessee, he came to Morgantown in 1986 to train with WVU coach and Olympic wrestler Nate Carr. “I fell in love with West Virginia. I started cooking barbecue at the side of the road, like the roadside vendors we had down South, to raise money to train for the Olympics. 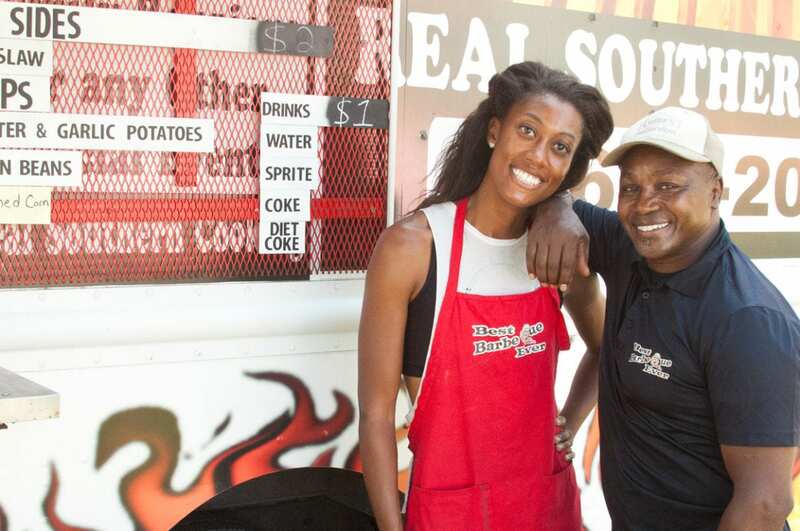 I stepped it up a notch with my own personal recipe, the dry rub and barbecue sauce I created by trial and error.” Heard became a two-time Olympic alternate who medaled in the Pan- American Games and World Cup— and now he makes a medal-worthy barbecue. The truck menu changes from week to week. “We do smothered steaks, and then we have the barbecued chicken, pulled pork, ribs, and brisket,” Heard says. The long list of from-scratch sides includes mashed potatoes and gravy, baked beans cooked on the wood-fired grill, and Southern stir-fried cabbage. The hickory-smoked barbecued pulled pork and the brisket sell quickest, he says. 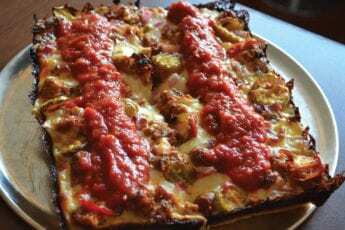 Also popular is the Santa Maria Italian: a 6-inch bun with Italian sausage, peppers, and onions, covered with the pulled pork. Morgantown barbecue lovers can find Heard at the mid-day WVU Medicine Farmers Market on Wednesdays. Or try the Laurel Point soccer fields south of the Morgantown Mall on Monday, Wednesday, and Friday evenings. Heard sells plenty without marketing but hopes to start keeping fans posted on Facebook soon. Sometimes a restaurant just isn’t enough. Burke Manning’s family opened Pita Pit on High Street in 2005. He’d grown up all over but moved to Morgantown to help out. Now he’s co-owner of the restaurant and considers Morgantown home. 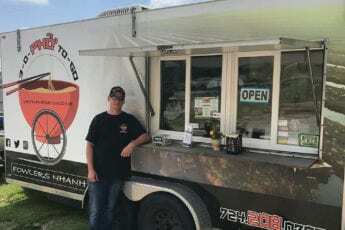 Serving food to the downtown crowd suits him—so much that, in March 2016, he bought a food truck on Craigslist so he could do it at night, too. “I spent March until the beginning of July building it, getting the equipment in, installing the sink system,” he says. “I hand painted the whole truck. It was a fun experience.” He joined the High Street late-night scene in July 2016 and, with an upgrade to what he calls “the Ferrari of generators” in September, has kept at it year-round. “We’ve got soft and hard tacos and a Taco in a Bag,” Manning says—that’s in a bag of corn chips, often called a “walking taco.” “We’ve got three different sizes of nachos, some with just nacho cheese and chips, and the bigger one gets chicken, rice, beans, and, if the customer wants, lettuce, tomato, guacamole.” Diners can load up with sour cream, salsa, hot sauce, Sriracha, and specialties like salsa verde, peach pineapple chipotle salsa, and white corn black bean salsa. Cody Thrasher started working in restaurants when he was 15. He liked the work and the atmosphere, so he taught himself to cook. “I went to Barnes & Noble, bought the Culinary Institute of America textbook for $75, and read it from cover to cover,” he says. 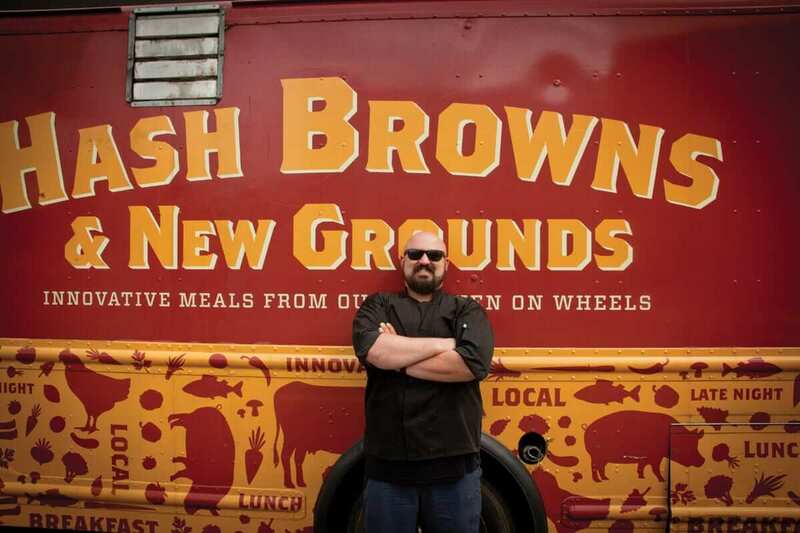 He also liked the idea of being his own boss so, in 2014, he turned the key on his used, re-customized food truck. He named it for fried potatoes—a dish people everywhere like— and for all the places the truck might take him.